Organisations are living with a level of fraud risk & error when making payments to payees that they now don't have to. The digital age has introduced new risks for accounts departmentsand therefore we need new ways of solving them. Someorganisations are even unware of the level of error and risk thatexists in their source file for electronic payments - the Vendor Master File. 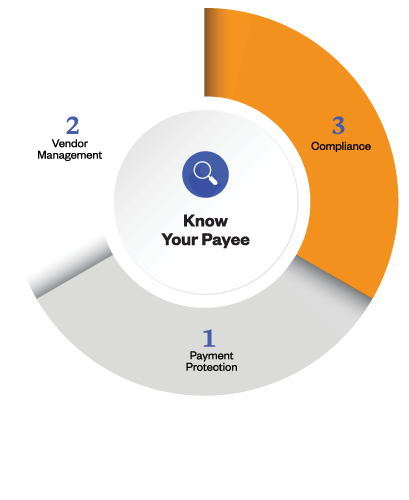 EFTsure solves these problems through ‘Know Your Payee™’ (KYP),its unique ﬁnancial technology. A Vendor Master File (VMF) holds all the information for your organisations numerous payees. Without a digital veriﬁcation system, an organisation rolls the dice that their internal controls are good enough because there is no way of verifying that the name that a payment is being sent to, matches with the BSB and account number that it is actually going to. In the digital world, there is now no reason to roll those dice. Don’t let pride in your existing system get in the way of progress and a better way of working. Old-fashioned internal controls haven’t kept up with the digital landscape and the new challenges organisations face.